No matter if you are a new or old student at the University of Borås you might have some questions about library cards. To be able to borrow books from the Library you need a library card, but how do you get it? And is anyone allowed to borrow books from the Library? How does it really work? As a student at the university you don’t have a specific library card, it’s the black chip that you received at the introduction that you use when borrowing books. When you’re about to borrow a book you need the chip and the PIN (four digits) that you chose when you got the chip. If you have forgotten the PIN, no need to worry, bring your ID card/passport and visit the Information Point in the Library or the Student Center and you can set a new PIN. The same goes if you have not yet received a chip, bring your ID card/passport and visit the Information Point in the Library or the Student Center. If you are registered as a distance student and need your library card before your first meet up in Borås, fill in this form and we will send you a chip. Are you not a student at the University of Borås, but you still want to use the Library and borrow books? That’s perfectly fine! Bring your ID card to the Information Point in the Library and we’ll make sure that you can borrow books. You won’t get a physical library card (or chip), instead you will use your Personal identity number and a PIN when you are borrowing books. A reference copy of all required textbooks are available on the 1st floor – these books can not be borrow and are only for use in the library. Most of our materials can be found by searching in Summon (our discovery tool). You find the searchbox on our website. Photocopying is available the 1st floor. Printers are available on level 2, 3, 4 and 5, be sure to select the printer on the floor you’re on. Most study rooms are located on floor 5 – You book the room through Kronox. All books are in numerical order – from 000 on level 2.5 to 999 on the 4th floor. Adjust the sound level to a normal conversational tone, this is a place of work for many people. Mind also to put your phone silent. Keep in mind that you’re not allowed to eat in the library. Drinks with lids, fruit and candy are ok but for eating please visit the café outside the library, or the lounge with microwaves on the second floor outside the library. Towards the end of the year, your own lunchlounge will be ready where our previously quiet reading room was located. If you need help with informationseeking just come ask the librarian at the informationpoint, we will gladly help you. If you have questions concerning your account, trouble in Word or other questions we will try to help you the best we can. Read more on our website where we gathered information for you as a new student, or our quick guide to library resources. Follow us in social media, so you’ll never miss tip from us regarding everything from hidden treasures in our collections or how to search in a database! 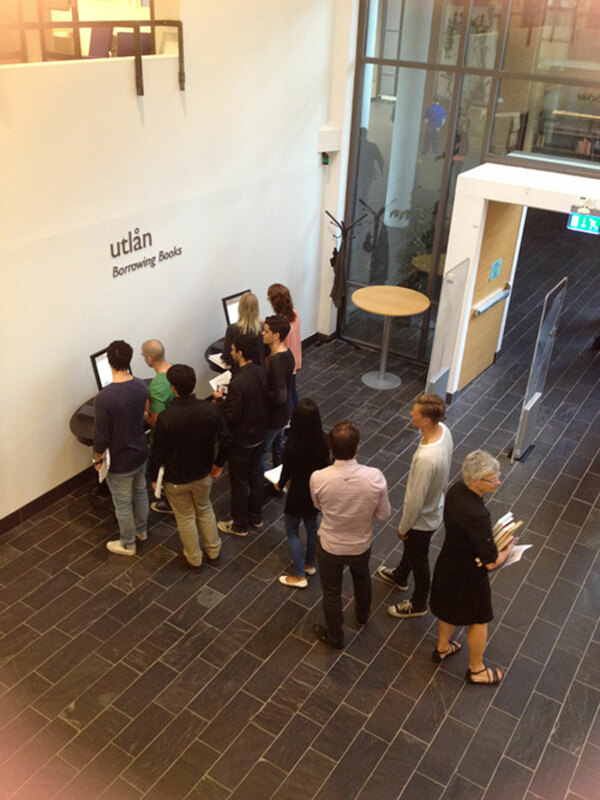 Yet again – warm welcome to the Library at the University of Borås. We at the library like to welcome our International students to the University of Borås. If you have any questions your are always welcome to the library. Read more about Borås where you will be spending the next couple of months. We wish you a great semester here with us. There are still a couple of weeks before the fall semester starts. Hopefully everyone is filled with energy from the summer and are full of expectations for the semester and all the new knowledge. To keep up with us at the library you could follow us on Facebook and Twitter. You can also tag the University of Borås with #hogskolaniboras in Instagram or follow hogskolaniboras. Here are some tips from us at the library to all new and old students. You will be needing course litterature. There are a couple of ways to get your hands om course litterature. you can buy used books. Check out University of Borås Facebook (mostly in Swedish) noticeboards outside of the library and the red lunch restaurant in Balder. You can also find used course litterature at kurslitt.se. or at kurslitteratur.se. We have course books for loan but we only have one or two copies, but we have a reference copy which is not for loan. You may read it here at the library. Read how the course litterature works. Books that are on loan can always be reserved. The loan period is shortened and you should receive the book shortly. Read rules and regulations for borrowing books. Sometimes we might not have the book you are looking for but then we can either borrow it from another library or if our librarians think that it could be useful to our users we purchase the book. Read about loans and purchases. There are resources to ease your studies if you happen to have some reading or writing difficulties. Studies here at the University of Borås means that you will have to write reports, papers and thesis. In these you must refer to different types of sources to build and defende the arguments you make in your paper. You should learn how to manage your references. You should also be critical of your sources and you should not plagiarize. Also, you need to think of the copyright law. You will probably have many questions and thoughts and you are always welcom to the library with them. We will resume our ordinary opening hours on Monday 16th of August, Mon – Thu 8-20, Fri 8-18. We will also be open on weekends, Sat-Sun 11-16. Check our page for new students for more information on e.g. searching information, databases, the buildning and what kind of data support we offer at the library. Welcome to a new fall semester with us! Welcome all our new students! The Fall semester started yesterday and for many of you it was a familiar place to return to, but for some, The University of Borås is a totally new place. We want to welcome you all, both new and old students, to the University Library. Come to our lounge to relax, flip through the magazines, and visit with your friends. Don’t hesitate to ask when you have questions, we will try our best to make you feel comfortable at our library. On the first floor there is a reference copy of all compulsory course literature. You cannot borrow these books; they are for use inside the library only. There is a loan-copy of all course books. They can be found at the appropriate subject headings on the shelves. A lot of the course books may also be found as e-books. The copying machines are on floor 1 and floor 3. Printers can be found on floors 2, 3, 4 and 5. There is a quiet study room (no computers allowed) on floor 2. All books are in numerical order, starting with 000 on floor 2,5 and is concluded with 999 on floor 4. Adjust your speaking volume – talk by all means – but in normal or lower voice. The library is a working environment for both the students and librarians. Switch your mobile to silent mode etc. You are not permitted to eat at the library. You may have drinks with lids, fruits and candy but if you want to eat something else the café is right outside of the library. When you need help with information seeking contact a librarian at the information point on floor 2. When you have questions or problems with you user account, Word or other computer programs contact our Computer support on floor 2. They are open 11-13 and 15-17 Monday through Thursday and 12-16 on Fridays. You can find math support on floor 1 Monday through Friday from 15 onwards. Students from the School of Engineering will be there to help you with math problems. So, when you have questions, don’t hesitate to ask! Ps – we can see that many of you has already stopped by:-) Great!